Ride The Ultimate Stunt Trike! Atomic Zombie’s SpinCycle extreme 360 stunt trike gives you a radical experience that is like a cross between a carnival ride and a racing bike. You will experience intense g-force as you rocket into a multiple 360 degree spin from an all out sprint, rotating around on the unique triple wheel steering system. 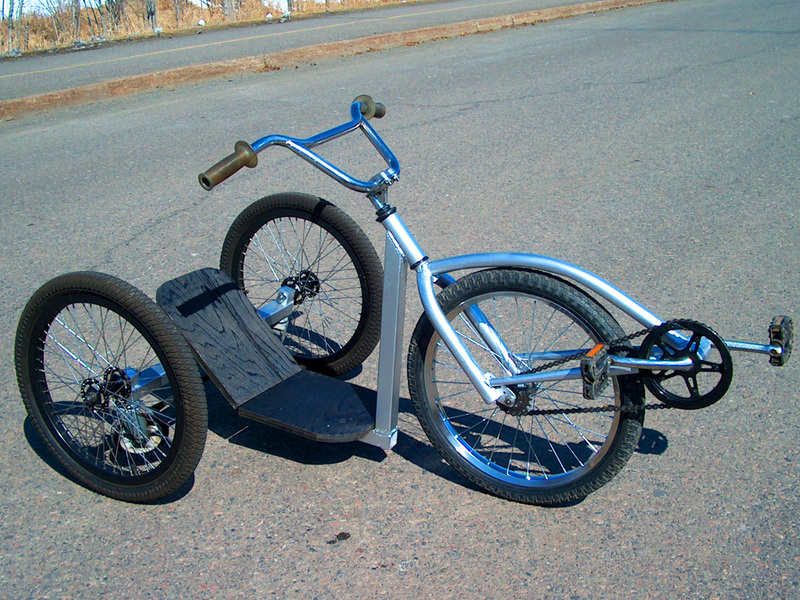 Our DIY stunt trike plan will show you how to build this one of a kind stunt trike using basic tools and commonly available bicycle components on a shoestring budget. 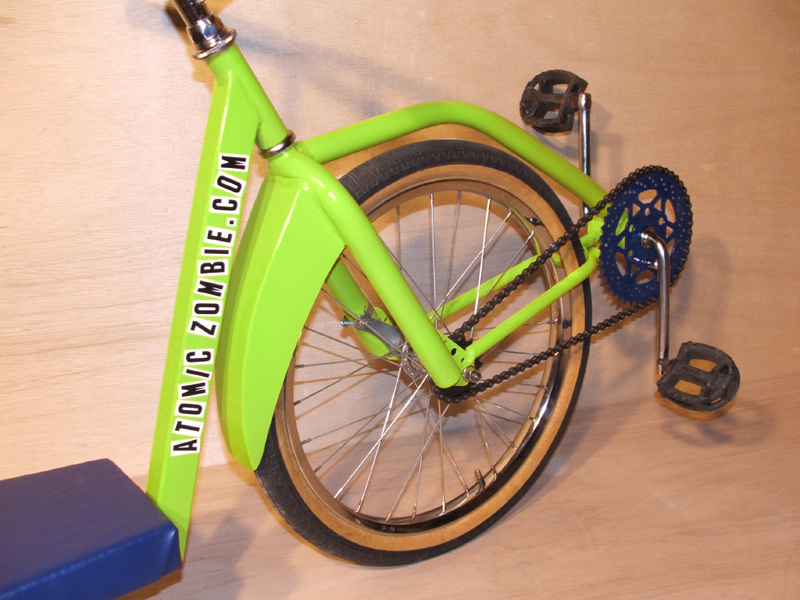 Looking for something to do with that old BMX bike sitting in the back of your garage? Turn it into something fun for all ages! In a weekend you can spin out of your workshop on a crazy spin trike that rides like nothing you have ever seen before. Endless 360 Degree Spins and Drifts. Copied by Razor and other companies, this is the original that started it all 20 years ago! Of course, no factory made toy will take the abuse that this one will! Blast up to speed, crank the wheel, and then enter the vortex as you twirl around for some serious crazy stunt riding. This unique stunt trike steers on all three wheels, so it can do twists and turns not possible on any other type of vehicle. SpinCycle offers a truly unique ride. Those cheaply made hardware store knock-offs won't hold up! 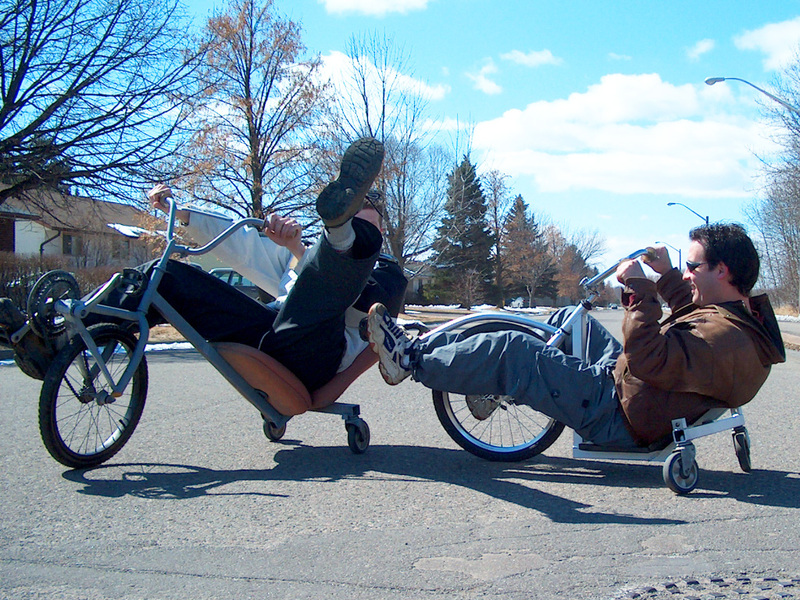 Nothing beats the durability of a real DIY Stunt Trike, and yes it is great for all ages. Hack that old BMX bike into something amazing that will take any amount of abuse you throw at it. Total Control of The Ride. The SpinCycle is a front wheel drive delta trike lowracer that steers on all three wheels, allowing for 360 degree spins and amazing t-slides at the flick of the wrist. Although it may look like you are completely out of control, you actually have total control over the angle and rotation as you steer and lean on the SpinCycle stunt trike. Brakes are provided by a front coaster hub, so you just pedal backwards to slow down or stop. The front steering and transmission system is made from a recycled BMX bike that you modify for front wheel drive. The casters can be purchased at the hardware store or removed from a junked shopping cart. No part of this DIY stunt trike is expensive. Build Multiple Stunt Trikes For Fun Battles. This DIY Stunt Trike is so easy to build that you may want to make several at once so you can host parking lot duels and obstacle course contests. Several SpinCycles running together at once is huge fun! Race for time through an obstacle course, try some kind of hybrid street hockey, or try to grab a flag from your opponents trike. 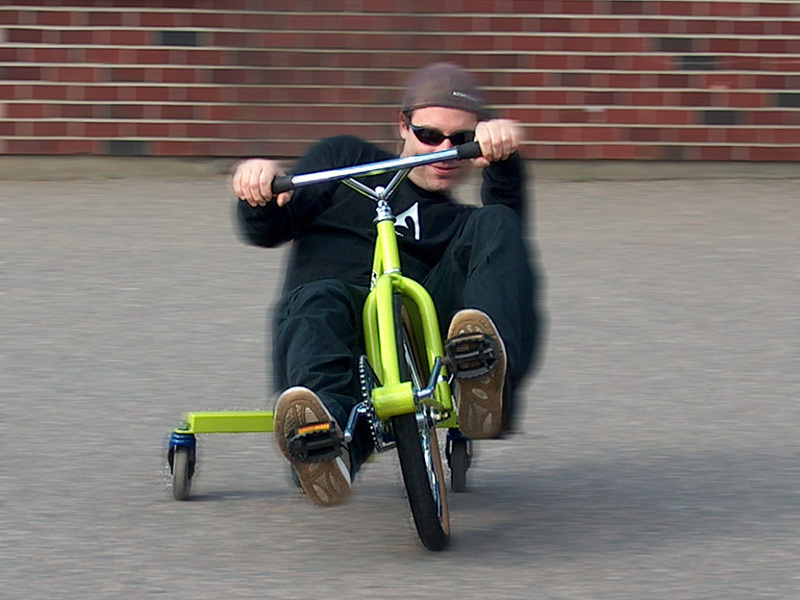 The possibilities for high speed crazy fun are endless on this wild DIY stunt trike! The main frame can be made of any type of thin walled round or square tubing. You can modify the size of the frame and position of the cranks to fit any size rider, and try intersting mods to make the wild even more intense. Rides Like It's On Ice, But Can't Tip Over. 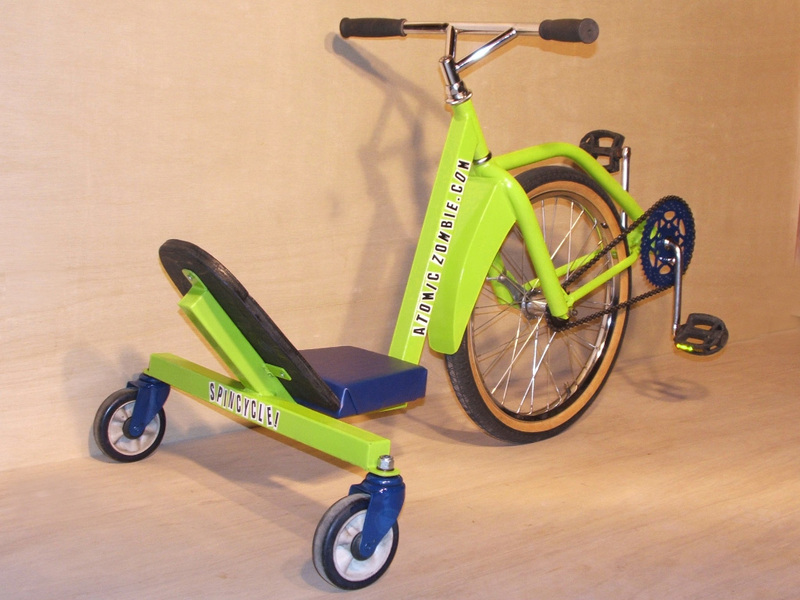 The SpinCycle DIY stunt trike will fit most riders and can be built using a smaller front wheel for younger stunt pilots, and all of the components needed can be salvaged from a basic kids BMX bike. The frame is made of mild steel square tubing, and all of the critical performance angles are easy to cut by following our detailed step by step plan. All you need is an angle grinder and a welder in order to create your own home built stunt trike. Build any type of seat you like, from the simple plywood and foam seat shown in the plans to something as elaborate as a modified car seat or office chair. 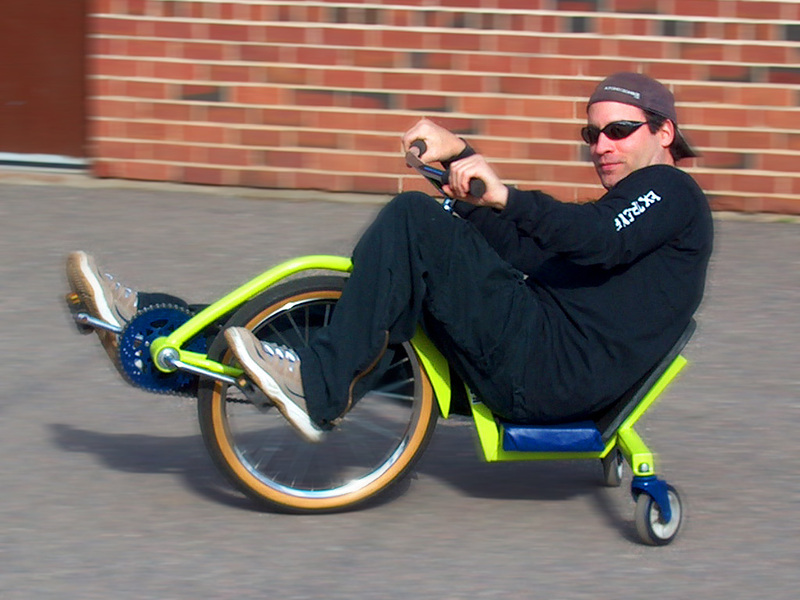 Every part of this crazy DIY stunt trike is easily modified so you can spin your own creation. Build Something Fun From Your Junk Bikes. Pedal as fast as you can to gain speed and then flip the handlebars to throw the SpinCycle into a full high speed 360 degree rotation. Once you become more skilled on this amazing stunt trike, you will be able to rotate around non-stop or until your appetite for motion sickness is satisfied! Some of our creative bike builders have even mounted full sized wheels to the rear of the SpinCycle to turn it onto a street worthy lowracer delta trike. There is always plenty of room for creative modifications of your own in our easy to follow DIY bike plans. Since every part of the SpinCycle is hand made using basic tools, you can carve out your own unique stunt trike using the parts you have on hand. Convert it Into A Lowracing Street Trike. You can also add full sized rear wheels to the frame and create a functional street ready recumbent trike with agile and stable steering. Removable rear wheels let you ride to your next jousting battle and then instantly convert back to stunt trike mode for all out insanity. Front wheel drive is very efficient since it delivers power directly to the wheel, so this project makes a good experimental base to try other forms of human power. All cutting can be done with an angle grinder or hacksaw, and any basic welder can be used to weld the steel frame tubing. The first SpinCycle prototype was built 20 years ago on my front patio in one afternoon. 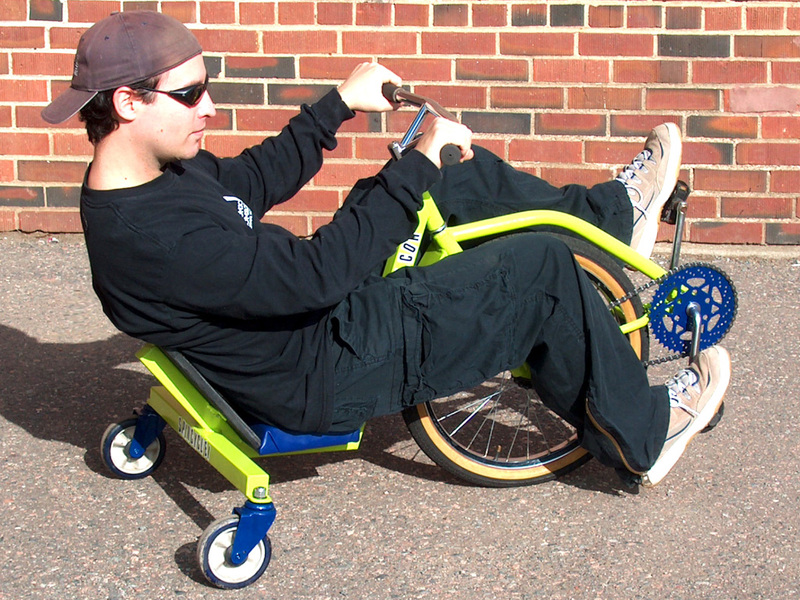 Anyone can build this fun DIY Stunt Trike! Experience a Ride Similar to Astronaut Training! It's difficult to explain how much fun it is to steer on all three wheels at once, spinning in circles or drifting like a race car on a track. You really have to ride it to fully experience the fun. Build your own crazy 360 degree spin trike for next to nothing and roll out of your workshop and into the vortex. If you can take the non-stop attack of intense g-forces and the onslaught of dizzying 360 degree rotations, then this is the crazy ride for you! You can build your own stunt trike in a few days and set out to begin your own astronaut training in a parking lot near you. The SpinCycle is a unique wild and crazy stunt trike that will offer hours of entertainment for adrenaline junkies of all ages.